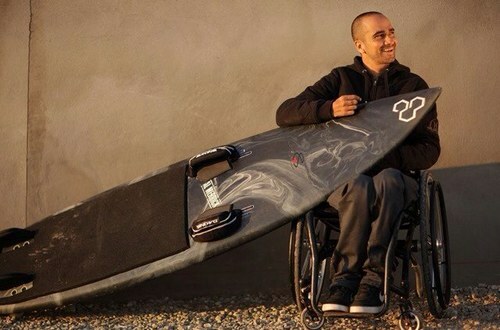 Jesse Billauer, World Champion Adaptive Surfer and Founder/Executive Director/ CEO of non-profit organization, Life Rolls On, will speak to Bacharach’s Spinal Cord Injury Group on Thursday, October 15, at 4:30pm in Pomona. His lecture series is called Jesse’s Story: Passion Over Paralysis and he will talk about his experiences with personal motivation in the face of extreme adversity. As a teenager, Billauer was one of the top 100 junior surfers in the world. At age 17 he was knocked off his board and slammed his head into a shallow sandbar, severing his spine and instantly paralyzing him. After graduating from college in 2002, he founded Life Rolls On, a non-profit dedicated to improving the quality of life for young people affected by spinal cord injury. The organization held a surfing event in Wildwood this past June called They Will Surf Again. The events are held all over North America and empower paraplegics and quadriplegics to experience the freedom of mobility by riding a wave with the assistance of adaptive equipment and dedicated volunteers. Many participants at the event were part of Bacharach’s Spinal Cord Injury Group.